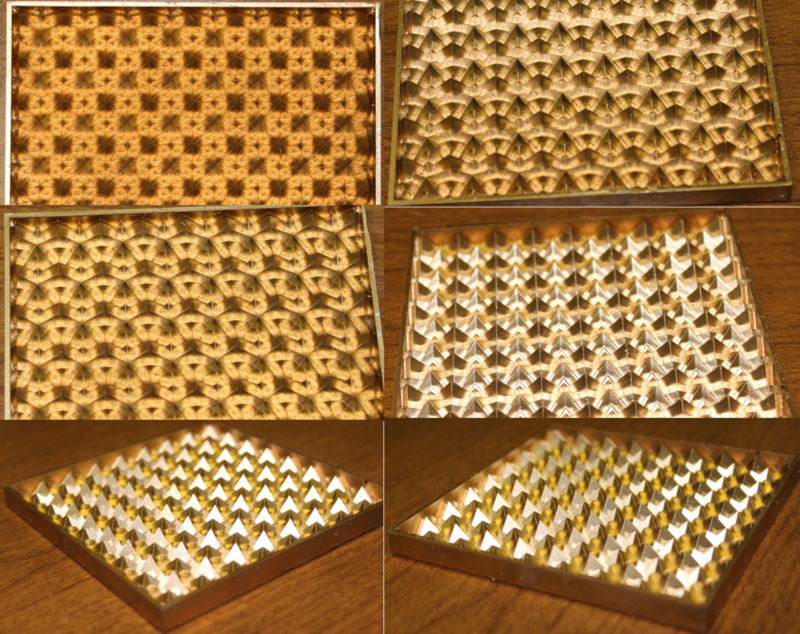 Tailorable truncated retroreflector array (TTRA) technology can be used to design kitchen and bath tile, which can be made entirely of plastic, where the reflective surface of each tile provides a unique and beautiful glow that changes with the source or sources of light encountering the surface and the location of the viewer relative to the tile. 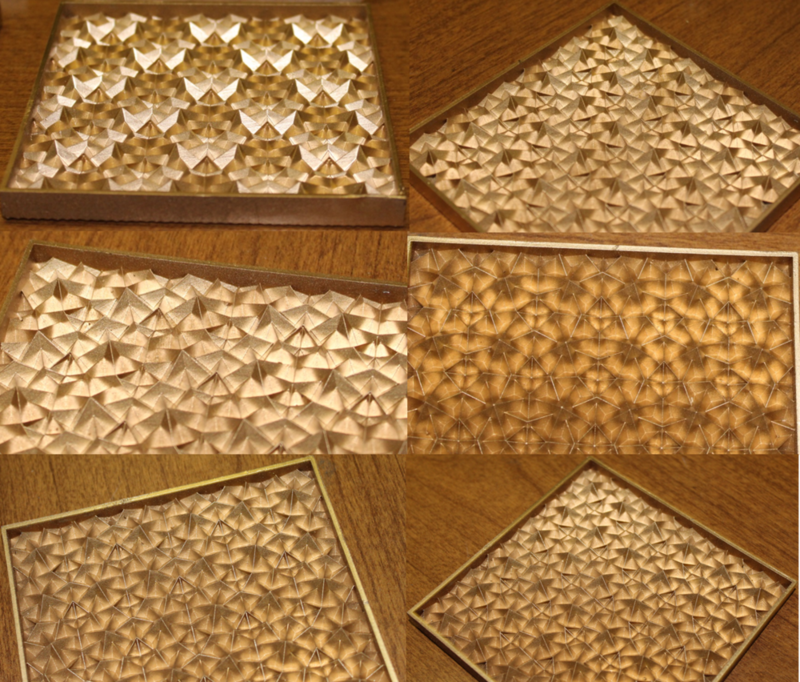 Figures 1-8 present several prototype tiles manufactured using a resin 3D printer and spray painted with metallic paint. The tiles were photographed without a clear acrylic layer that can be added to provide the tiles a flat surface thereby enabling them to be grouted, cleaned, etc. Photographs of the tiles with a clear acrylic layer are provided in Figures 9 and 10. Figure 1 depicts various views of a first prototype tile created using an equilateral triangular truncating object with a 30° truncation rotation. Figure 2 depicts various views of a second prototype tile created using an equilateral triangle truncating object with a 60° truncation rotation. Figure 3 depicts various views of a third prototype tile created using a right isosceles triangle truncating object with a 30° truncation rotation. Figure 4 depicts various views of a fourth prototype tile created using an isosceles triangle truncating object with a 45° non-congruent angle and a 30° truncation rotation. Figure 5 depicts various views of a fifth prototype tile created using a rectangular truncating object with a 1.5:1 length-to-width ratio and a 30° truncation rotation. Figure 6 depicts various views of a sixth prototype tile created using an isosceles triangle truncating object with a 45° non-congruent angle and a 0° truncation rotation. Figure 7 depicts various views of a seventh prototype tile created using an isosceles triangle truncating object with a 45° non-congruent angle and a 15° truncation rotation. Figure 8 depicts various views of an eighth prototype tile created using a right isosceles triangle truncating object with a 15° truncation rotation. 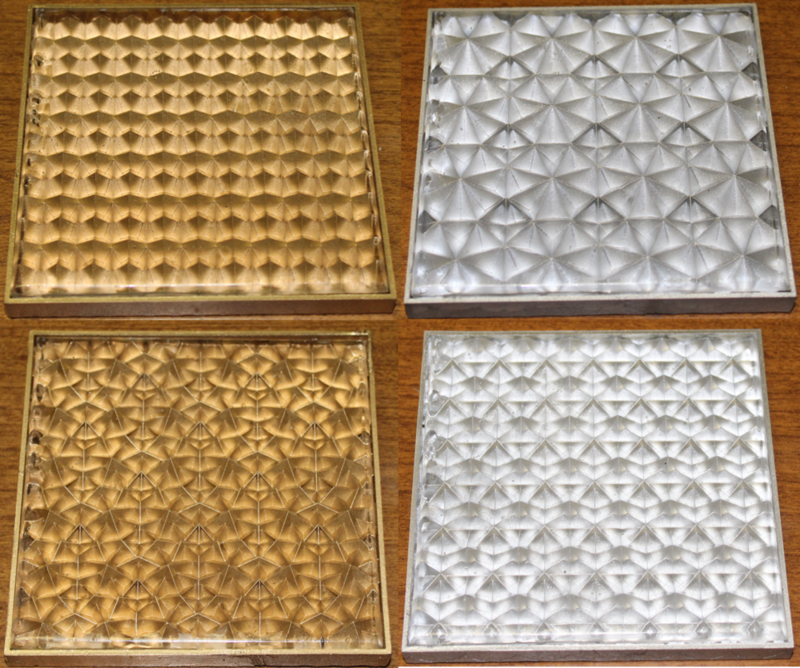 Figure 9 depicts prototype tiles one through four with an added clear acrylic layer. Figure 9. Prototype tiles one through four with an added clear acrylic layer. 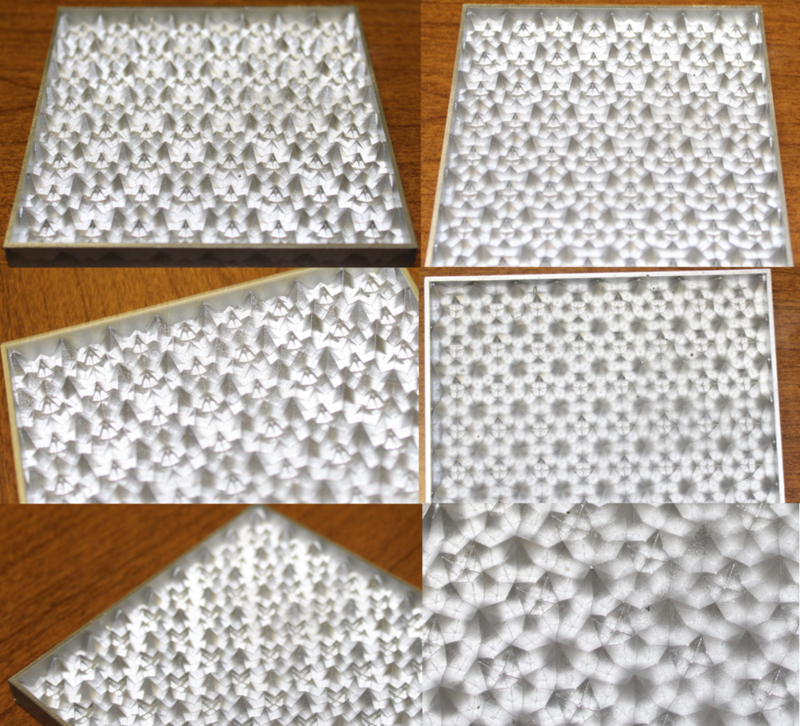 Figure 10 depicts prototype tiles five through eight with an added clear acrylic layer. Figure 10. Prototype tiles five through eight with an added clear acrylic layer.